Tad Stones is a Producer/Writer/Artist who started his animation career at Walt Disney Features then moved to Disney Imagineering to design rides for EPCOT Center. He was one of the founders of Walt Disney TV Animation where he created such shows as Chip ’n’ Dale’s Rescue Rangers and Darkwing Duck along with several feature spinoffs. 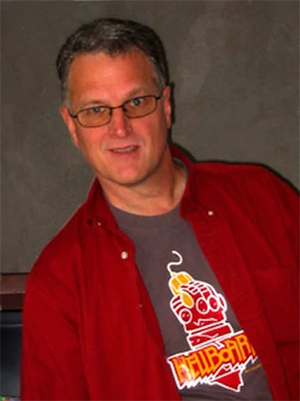 After 30 years at Disney, Tad produced several direct to video features, most notably two Hellboy animated movies, Hellboy: Sword of Storms and Hellboy: Blood and Iron. His last project was co-writing and directing the first season of the Netflix Original Series, Kulipari: An Army of Frogs which is currently streaming and has been renewed for a second season. Now retired from animation, Tad is playing with a comic project and enjoys meeting the fans of his shows at conventions where he sells original art.